Dahlin Group Architecture Planning (DAHLIN) has been inducted into the 2016 Best in American Living Awards' (BALA) Hall of Fame class. In its 33rd year, BALA's design awards spotlight the most creative and innovative projects in the building industry while the BALA Hall of Fame, added in 2009, recognizes some of the most innovative and well-respected individuals and companies in the industry who have significantly affected residential design and construction. 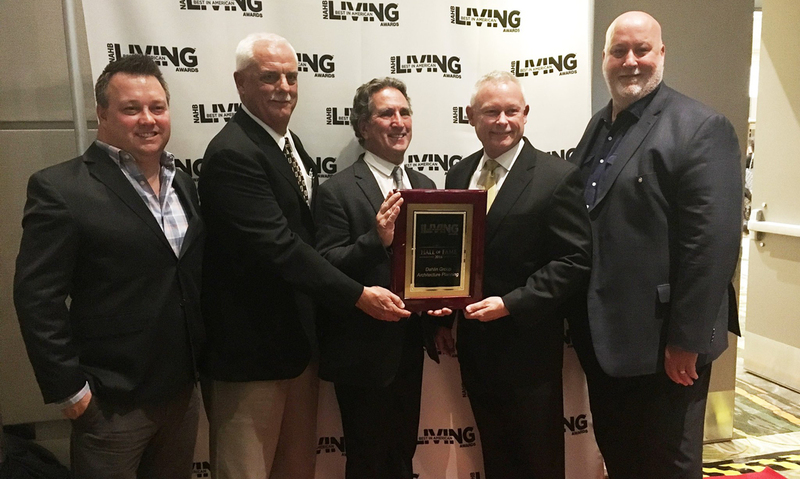 Douglas P. Dahlin, firm founder, and John M. Thatch, Senior Principal and Design Director, accepted the award on behalf of the firm at the American Living Awards Gala during the annual NAHB International Builders' Show on January 11, 2017 in Orlando, Florida. John Thatch, one of DAHLIN's key leaders in the firm's relationship with NAHB, said, "Personally, it has been my privilege to be a part of a firm committed to creating innovative designs for builders that are contextually relevant, enduring, buildable and marketable. It is a wonderfully rewarding achievement for the many talented designers and planners, who are the heart of the firm, to receive the industry's affirmation of our long-standing commitment." Headquartered in Pleasanton, California and founded in 1976, the year of 2016 marked DAHLIN's 40th anniversary, both as a firm and in serving the homebuilding industry. The firm, which started as a one office residential architecture and planning firm in California's San Francisco Bay Area, is now a global firm with six offices along the West Coast and in China, operating in both residential and nonresidential markets. "DAHLIN's deepest roots are in the homebuilding industry, and as such, it is an immense honor to be recognized by our industry peers, clients, and friends," said Doug Dahlin. Over the last 40 years, DAHLIN projects have been recognized in the BALA design awards 63 times, and the firm continues to maintain their commitment to excellence in residential architecture, with their most recent BALA design recognitions being in the 2016 awards for: Classics at Centennial Place in the Detached Home up to 2,000 sqft, Built for Sale category, and Miraval Mesa Verde in the Detached Home 3,001-3,500 sqft, Built for Sale category. DAHLIN's induction into the BALA Hall of Fame honors that the firm's contributions to the industry taken in whole is greater than the sum of individual projects. Dahlin said, "While looking back at how the industry has evolved and how our firm has progressed in the last forty years is deeply inspiring and satisfying, our most exciting years are still ahead of us. We will see the maturation of innovations, such as self-driving cars, drone deliveries, and 3-D printing, that will challenge our industry to accommodate and respond with our own innovations—it's going to be a lot of fun." "The firm is thrilled to be inducted into the BALA Hall of Fame. It is not only an honor, but I feel it is demonstrative of our people's passion for creating communities and homes—whether they be affordable or market rate, for seniors or millennials—that bring dignity and inspire joy," said DAHLIN President Nancy Keenan. Regarding DAHLIN's future, Keenan said, "Our commitment to honoring and rewarding their passion was a driving factor in becoming an employee owned firm as it's our people's passion that will push DAHLIN forward over our next 40 years."